Amazingly, the Sony PlayStation is 18 years old this week. The console that defined a generation has come of age - a fact which, aside from being a sharp reminder of how old we've all got, has many of us donning our rose-tinted nostalgia specs and remembering the fun times it's given us. And it is in honour of those years of Sony-powered fun that TechRadar has compiled this definitive history of PlayStation home consoles through the years. The highs and lows. The favourite games that kept us awake till 5am. And what the games industry itself remembers of each era of enjoyment. Back in 1994, the original PlayStation was widely ridiculed by gamers at its Japanese launch, mainly because it bucked the dominant tech trend for home consoles set by the likes of Nintendo and Sega in the late 1980s. The games came on a CD (of all things!) and not on a chunky plug-in cartridge. Yet while Nintendo and Sega (and Amiga and ST) fanboys scoffed at Sony's upstart, the sales figures soon began to speak for themselves. This was a game-changer. Through various improvements, iterations and re-launches over the past 18 years, PlayStation has unquestioningly become the brand that is synonymous with gaming on the TV in the late 1990s and throughout the 2000s. While overall video game hardware sales are down this year, Sony has sold 70 million PlayStation 3 consoles worldwide since 2006 and announced the 70 millionth sale last month. Sony sold an incredible 269.7 million PlayStation consoles over the first 15 years of PlayStation (140.7 million of which were PS2s, 27 million of which were PS3s) and an astounding 2.632 billion PlayStation games. So that means total PlayStation sales are somewhere in the region of 313 million consoles. There are now 3,590 PS3 games available, which amounts to 595 million games sold worldwide. PlayStation Network, the PS3's free online service, is now available in 59 countries worldwide, while the PlayStation Move controller, which adds motion control similar to the Nintendo Wii, has sold more than 15 million units. The announcement sees Sony catching up to the Xbox 360, which reached the 70 million total unit sales milestone at the end of September. While Sony and Microsoft battle it out in the console race, they're fighting for second place. Nintendo announced in September that the Wii reached 97.2 million sales since its launch. Eyes are now turning toward the next generation of gaming hardware, which begins this month as the Wii U launches worldwide. New consoles from Sony and Microsoft are also in the works, commonly referred to as the PS4 and Xbox 720, though details are scarce on either system. 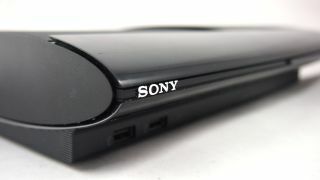 Rumors peg the new systems for release sometime toward the end of 2013, or even falling back into 2014, so Sony still has some life to squeeze out of the PS3. As you'll see from our history of the console, a new PS3 model, dubbed "super slim", launched just a few months ago, so it seems Sony still has a few tricks up its sleeve before it passes the torch on to the PS4. Let's take a trip down memory lane. Aaah, the original PlayStation. Where do we start? The real and deeply visceral future-shock of playing Ridge Racer on our TV at home is perhaps what we remember most vividly. The graphics! There genuinely had not been such a superbly realised and deeply immersive driving experience up to that point outside of your local seaside arcade. Playing Ridge Racer on the first PlayStation (that we bought second-hand for around a hundred quid from Loot back in 1996) was a revelation. It immediately made the lounge a far more exciting place to be. "Without shadow of a doubt, my favourite PlayStation game was WipEout," says Bethesda Games UK's PR Manager, Alistair Hatch. "There were a lot of games which I played to death on the PlayStation including the likes of FFVII, Ridge Racer, Time Crisis, Gran Turismo, and Tony Hawk: Pro Skater, but WipEout was revolutionary in so many ways that it stands as my favourite game on PlayStation."